Only 2 more blocks to trapunto and then the whole thing will be ready to be quilted! Phew, no pastel centers this time! And I wanted to thank everyone for so many warm wishes on our anniversary. Unfortunately, there can be only one winner of the $50 gift certficate, and that goes to Linda, from France! 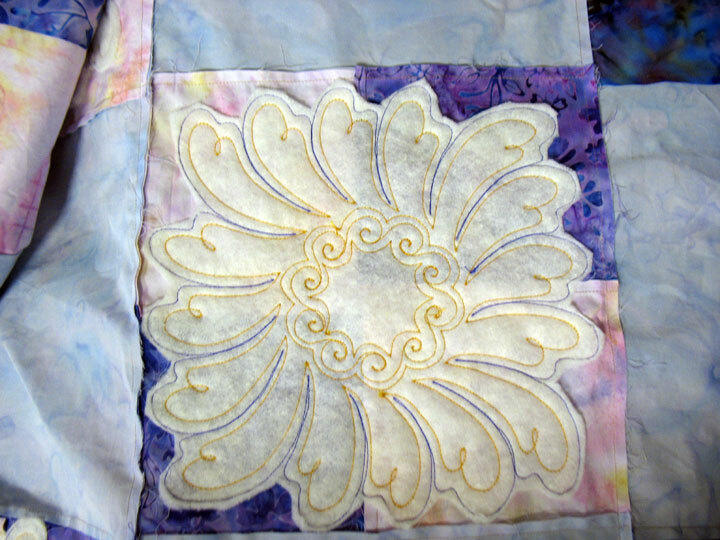 You can read her quilting blog here. 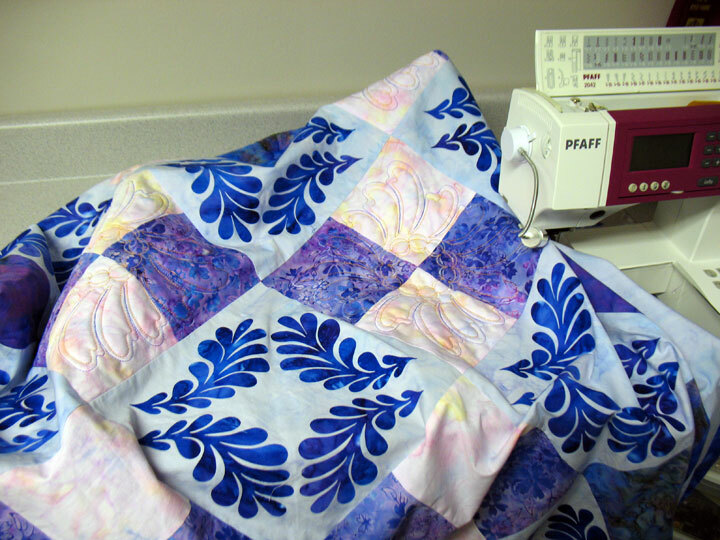 Filed under Appli-K-Kutz Fabric Cutting Dies, Fabric Dyeing, Free Motion Quilting, Sizzix, Trapunto. Love that silk charmeuse! I’m just starting to dye things myself. What dyes are you using? You’re colors are wonderful. 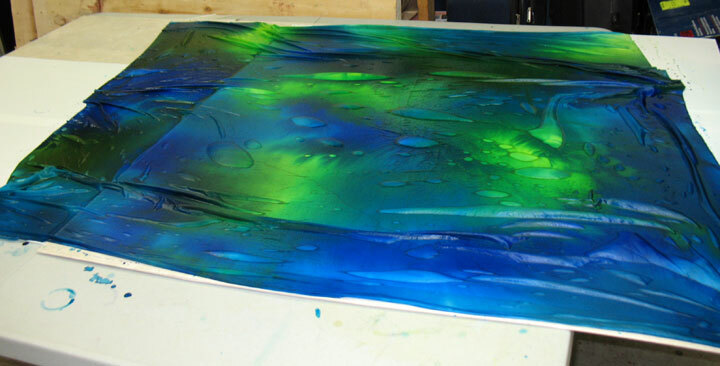 I’ve only dyed fabrics once in a class, but I loved it. I must try it again. That microwave method intrigues me, and that silk just looks gorgeous. Lucky Linda! 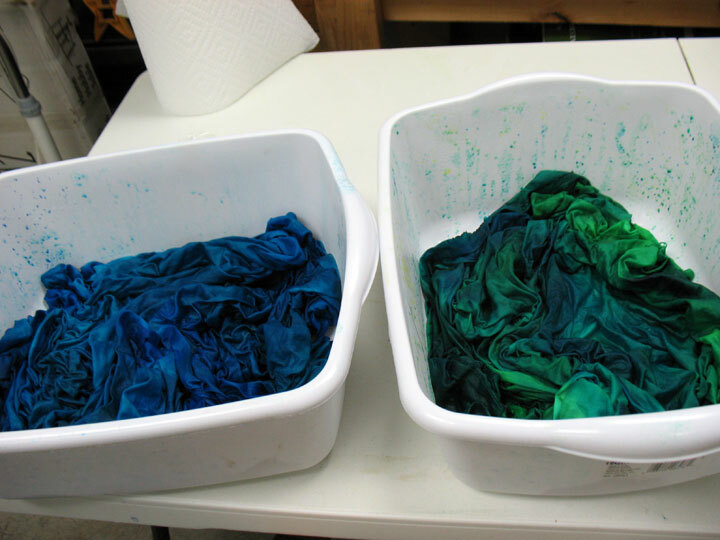 I love those dyed fabrics, yummm. And that new quilt is stunning. Love those blues, and blues aren’t normally my thing! I’ve thought about learning to dye, but then I look at the stash I already have…. Again, Patsy, your fabric dyeing is spectacular. I’m really seriously starting to think, we need a new house, with a separate suite, so I can try the dyeing, and all the other things I want to do. I was cleaning and organizing my quilt’n room yesterda, and no, not completed yet, and I quickly realized, I am out of room! Ah well, always good to dream. As always it’s great to see what you are up to. I’m not ready for fabric dyeing, but yours looks beautiful! 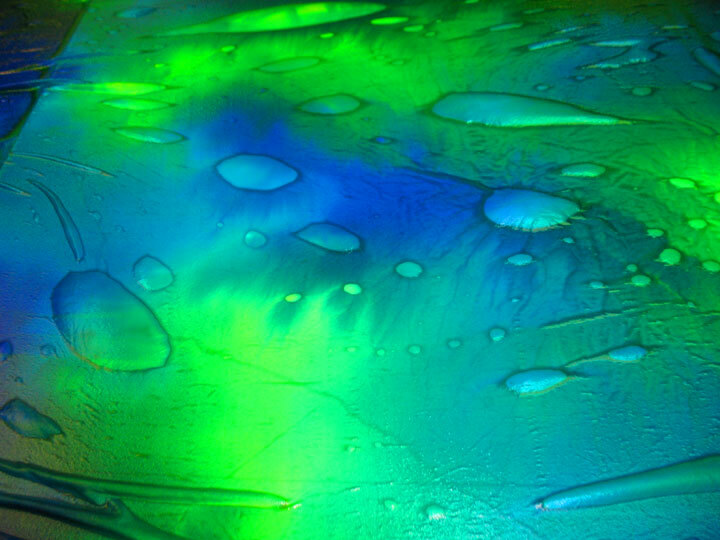 The dye pieces are beautiful but I wonder about microwaving plastic. I have heard so many things about not microwaving plastic with food, and I stopped years ago. But I also heard that it releases toxic chemicals in the air and those that stay in the microwave. I guess I am just really sensitive to that kind of stuff. Nice to see your progress Patsy, and it’s alot of progress if you ask me! 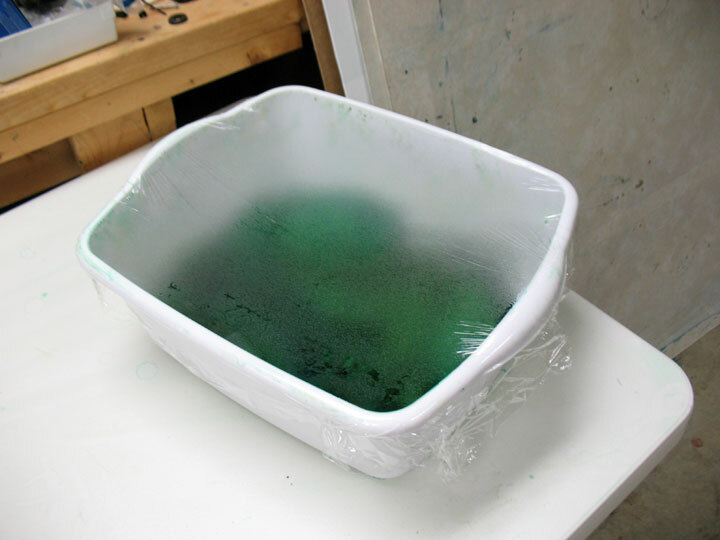 I LOVE the dyeing you’ve shown… oohs and ahhs from MT! Patsy, with microwave dyeing, are you just speeding up the curing time, or is it producing more vibrant results? I’m curious to give it a try myself. I love the colors. I have thought about learning to dye my own fabric but I am afraid I would have everything near by that color!